Shares of Wells Fargo are weak ahead of Friday’s earnings report. The stock is off 1.4% at mid day and is now trading below the March and initial April lows. 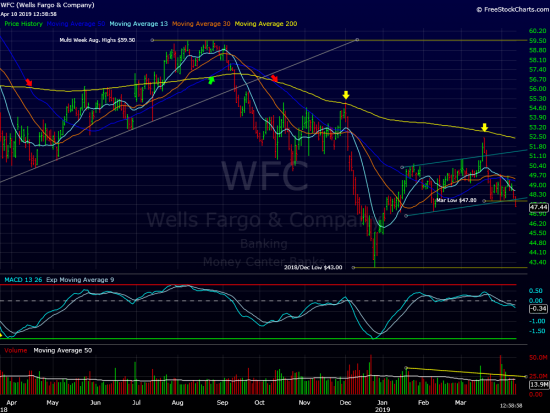 A close below the $47.50 area would mark WFC’s lowest close since January 3rd. This heavy action has left behind layers of supply. Investors believe mortgage weakness in the last quarter will hurt results. Much like the December peak, the March high is looking rather ominous. At time of publication we do not have a position in WFC.